This article is about the Bros. Attack in Mario & Luigi: Superstar Saga. For the fire spitting Hammer Bro, see Fire Bro. For the challenge from New Super Mario Bros. U, see Fire, Bro!. Superstar Saga Description Attack with fireballs. Fire Bros. is one of Mario's Bros. Attack in the game Mario & Luigi: Superstar Saga, based off of his Firebrand move. The attack costs six BP in Modes 1 and 2, and three BP in Mode 3. 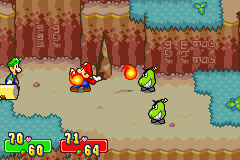 This attack has Mario standing in front of Luigi, pressing the at the correct intervals to charge up his Fireballs. Once a certain time has elapsed, Mario will fling the Fireballs he has made at Luigi (how many depends on how many times the was pressed successfully). At just the right time, the must be pressed to make Luigi hammer the fireballs into the designated enemy. Once the brothers have executed the attack successfully twenty-eight times, the Advanced Command is learned. In the Advanced version, Mario stores the fireballs into a large fireball to throw at the enemy. The commands are the same except that when Luigi hits the fireballs back, the player should immediately press to store the fireballs above his head. When all the fireballs have melded into a large fireball, Mario will jump up to it. Press again to spike the fireball toward the enemy. In Mario & Luigi: Superstar Saga + Bowser's Minions, Mario now flings a tiny fireball up and pressing the repeatedly causes him to rapidly hurl more fireballs at the first one, making it larger and larger. Once a certain time has elapsed, Luigi will hammer the huge fireball when the is pressed, splitting into multiple medium-sized fireballs that land on a single enemy. The Advanced command, now a separate Bros. Attack called 'Super Fire Bros.' has Mario start the same way. However Luigi now jumps upward, bouncing the fireball upward, for Mario to bounce up to it and spike it to the enemies. The fireball instead causes a massive explosion made for aesthetic effect and a shock-wave that damages all surrounding grounded enemies. This attack has a small chance of inflicting the Burn status on enemies. In Mario & Luigi: Superstar Saga + Bowser's Minions, it can also occasionally inflict the "Char" status on enemies. French Frères Feu Fire Bros.
Italian Fratelli Fuoco Fire Bros. This Bros. Attack is similar to the use of Fire Flowers in later games, and the advanced version is similar to the Mix Flower from Mario & Luigi: Partners in Time. In the remake, Mario now hurls fireballs in a similar manner to using the Fire Flower in other Mario & Luigi games. This page was last edited on March 28, 2019, at 09:52.